If there's one company that does a killer job of sponsoring high-voltage events, it's Red Bull. From flugtag races and urban boulder climbing to b-boy dance contests and freestyle skiing competitions, Red Bull knows how to bring energy and excitement to the people. This weekend, Red Bull is hosting one of its popular Soapbox Race events. For four years, it has organized races across the globe, including stops in Jamaica, Italy, Australia, South Africa, Finland, and of course, America. This Saturday's free event boasts 40 hand-made, non-motorized soapboxes. Some of the fun designs include a time-traveling DeLorean, a giant nose, a bunk bed, and an Aztec temple. The races are free to spectate and feature celebrity judges, including the popular Eric Estrada. I love it when companies find smart ways to bring events into their marketing efforts. The Red Bull brand is all about silliness, action, energy, and fun. 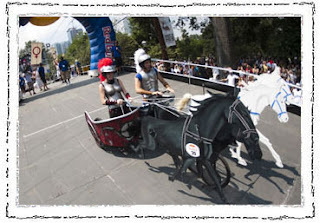 So, a soapbox derby with high speed action and whimsically decorated racecars is a perfect way to reinforce Red Bull's irreverent style and love for the outrageous. If you happen to be in the L.A. area this Saturday, why not spend a day at the races? It promises to be a fun afternoon with lots of action. And, if the heat makes you sleepy, I'm sure there will be plenty of Red Bull on hand to give you that second wind.